How should you advertise your email marketing program? Where should you advertise your email marketing program? Are your various touch points optimized? Are you truly leveraging all your channels? Should you offer an incentive? Email offers an effective way to engage your subscriber. Email is quick, email offers great ROI, email offers you access to tremendous reporting, email allows you to personalize your message, and email allows you to go across channel. The power of email is tremendous. 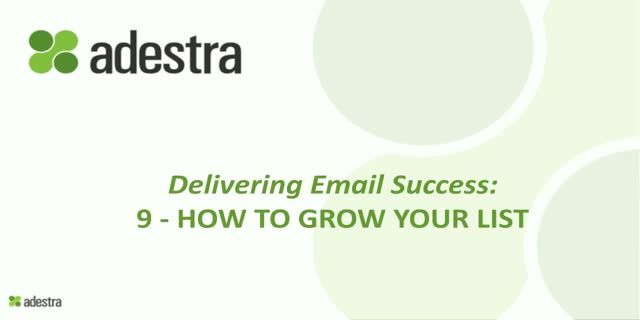 This webinar is part of a series of 25 proven, practical, and innovative tips to enhance your email marketing program. We will deliver each best practice tip over a 20-minute session. Useful information that you can apply back to improve your own marketing program. What is your value proposition on social media channels? What social channels do you leverage? How do you get your social connections to connect via email? How do you get your email subscribers to interact on social media channels? Have you done exclusive campaigns? Do your messages have a strong CTA? Are your landing pages optimized to support the CTA? Are your landing pages optimized for the type of device? What are the top landing page principles? How do you reuse the landing page? How many consumers view your campaigns on mobile devices? How many view them on more than one type of device? What are five key mobile considerations? How do you deliver the rest of the message? What is next in mobile? How do you know what they want? How should you enhance your basic message? What types of messages should you consider? Do you have a backup campaign? How should you personalize? Does it look good? What is good etiquette? What is required by law? Is your information well organized? What do you want them to do next? What are five reasons that get people to interact with you? What do you do with the information you collect? How do you evoke quick responses? Can they find your email on other channels? What do you do with those that do not interact? May we offer you 25 proven, practical, and innovative tips to enhance your email marketing program. We will deliver each best practice tip over a 15-minute session. Useful information that you can apply back to improve your own marketing program. Why should I sign up for your campaign? How should our value proposition be displayed to prospects? Is this message consistent across channels? Is it working? Do you show and tell? How much do you know about the consumer you serve? How many questions should you ask? How do you capture the three types of preferences? How can you be sure? How do you keep things up to date? Does real time make a difference? Can you give them a message that they can keep forever? How should you follow up on the first message? What else should you ask them? How should you introduce them to other channels? Learn how to engage your subscribers and customers with these easy and proven guidelines! Advice from the pros! In a recent Adestra survey of over 1,200 consumers, 48% of respondents said that discounts/coupons are the reason they subscribe to a companies email. Email continues to grow and evolve into both an effect and personal way to communicate with consumers. The amount of messages the consumer received continues to grow dramatically. What is it going to take to drive success in 2016 and what can you do to stop just selling "stuff" and work on providing the subscriber what they want. This will be an energetic discussion and with it being on St. Patrick's day, we expect to have a lot of fun! The holidays are over and you’re a month into the New Year. Do you have a plan or did you jump in where you left off in December? For many, it’s hurry all the time and what you need is a little leg up on what do to in 2016, but also how to set the right expectations. During this energetic session, we will touch on the 5 things that marketers should look to change in 2016 to increase their KPI’s and the level of sophistication. From transactional and triggered common optimization, segmentation, testing, process and how to get the most out of your ESP, we will touch on the most common challenges we see in the market. You’ll walk away with a plan that you can apply hours after the session! Join us! The digital rumour mill would have us all believe that email is done, finito, dead. But that couldn’t be further from the truth. If anything it’s just beginning. And harnessed to its full potential, email offers marketers all kinds of unique communication possibilities. Hosted by Adestra’s Account Director Parry Malm and LiveIntent’s Chief Operation Officer, Dave Hendricks, this webinar will prove to you that email is not only alive and well; it’s at the forefront of the digital marketing mix. Dan Bond moved from running email marketing programmes using MessageFocus to being Adestra’s Online Marketing Manager. In this webinar he shares some background on his experiences, and gives the inside scoop on how to get the most from your relationship with your ESP. Optimising email campaigns for mobile is one of the biggest challenges email marketers are facing right now. Developing and deploying responsive templates are touted as the holy grail, but require a large commitment of both time and budget. In this webinar, you'll learn top tips and best practices to ensure mobile readers are able to engage with your existing templates. From reporting to design, and points in-between, this presentation will leave you creating campaigns that are meeting the needs of your audience, no matter which device they use. No coding required. Subject lines are the crux of an email marketing campaign. If it’s good, your response rates will skyrocket… and if it’s bad, well, we all know what that means. And yet, subject lines are often an afterthought in email marketing. Following on from our popular 2012 report, Adestra have crunched the numbers on billions of emails again for 2013 to provide industry-specific advice on which subject lines are getting the best results. Big Data is the catchphrase of 2013. But, big data is nothing more than a sum of many parts – so, lots and lots of “little data.” Join our upcoming webinar to hear four ways you can leverage your little data into more effective (and profitable!) email campaigns. 4. How to use behavioural data to personalise & trigger effective emails. The Adestra and Econsultancy Email Marketing Census results are hot off the press, with some surprising results. 61% of email marketers rate their email marketing as ‘poor’ or ‘average’. Email is a mature channel and a serious revenue generating tool – so why is performance so low? Join us for our webinar and gain a unique insight into the email marketing industry and how you can stay ahead of the game. As an additional bonus, all attendees will also receive a copy of the report worth £250. Direct marketers often target customers with offers based on their location, but it has not been so common in email marketing to segment data and target subscribers in this way. With more marketers understanding that their emails need to be ultra-relevant and more precisely targeted, how can we use location to increase engagement with our subscribers? Adestra is trusted by top companies like UBM, FranklinCovey, Incisive Media and The London Symphony, among others. Established in 2004, Adestra is based in Oxford, United Kingdom with offices in London, Dallas and Sydney.